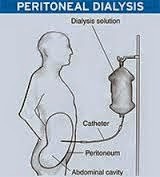 for Peritoneal Dialysis at home. So he made me an appointment with the surgeon. I diligently went to Pinehurst (where there is a surgery clinic like unto Mars) and met with the Duke-trained surgeon. The first thing he says to me is, "You don't need this put in place until you're ready for dialysis." Whew!! My kidney function, while low, is stable. So this is a good thing. So thanks, Nephro. The surgeon also said I was an excellent candidate for home dialysis because I understand the procedure and what it entails, including the dedication to hygiene. And it can be done at night while I sleep! So I am greatly relieved that I will never have to have hemo-dialysis. windows and doors He opened. Thanks for being there, and understanding. What a great relief. Excellent news!